I like to cook, but I don't like following recipes. For me to actually follow a recipe, it has to be simple -- simple ingredients, simple steps. That's one of the reasons Gina Von Esmarch's cookbook, Taste This!, has been one of my go-to cookbooks for years. The second reason is that the dishes in her cookbook are so darn good. So now that she has come up with a second cookbook, named Taste This! The Delicious Sequel, how could I not try these recipes as well? The dishes in Taste This! The Delicious Sequel are a bit more intricate, so I was initially somewhat reluctant to start. But I trust Gina -- her family owns the famous Fisherman's Wharf restaurant, Alioto's, so she knows what she's talking about when it comes to food. And I was right -- some of the recipes may be a bit more complex in preparation, but so are the flavors. What's more, there are a ton of recipes that are so easy and delicious, all I can say is, you've got to Taste This! Gina is hosting a "virtual potluck" today -- some of her favorite bloggers are featuring recipes from Taste This! The Delicious Sequel on their blogs, so you can blog hop and check out some of the best dishes from the cookbook. I was in charge of appetizers, and my family love them so much, I added a fruit salad and crusty french bread, and we made a whole meal out of them. Hungry for more? Check out my Taste This! Potluck post for more photos and how-to's, and check out Taste This! The Delicious Sequel on Amazon! 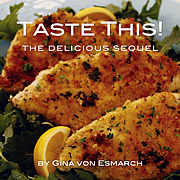 One lucky Bonggamom Finds reader will receive a copy of Gina's cookbook, Taste This: The Delicious Sequel. Leave a comment on this post and share some dishes your family loves to eat. This entry must be completed before any extra entries will count. 1) Leave a comment on my Taste This appetizer post and tell me your favorite appetizer (1 entry -- you don't have to leave a comment here, I will be including the comments on that post in the pool of eligible entries). 5) Blog about this giveaway, making sure you include a link to the giveaway (http://bit.ly/IQ0EYz) in your blog post (1 entry). 6) Like Bonggamom Finds on Facebook (1 entry). This giveaway ends at 11:59PM PST on May 20, 2012; I will draw a winner at random on May 21 and post his/her name after she/he confirms acceptance. Continental US residents only. For additional giveaway rules, click here. Good luck! Disclosure: I received a copy of the book for review, and a second copy to give away.. The views and opinions expressed here are my own. Some of our faves are spaghetti with meat sauce, enchiladas and beer can chicken! Pasta with garlic, extra virgin olive oil, red pepper flakes, and Parmigiano Reggiano. Congratulations to the winner: #6, gail!